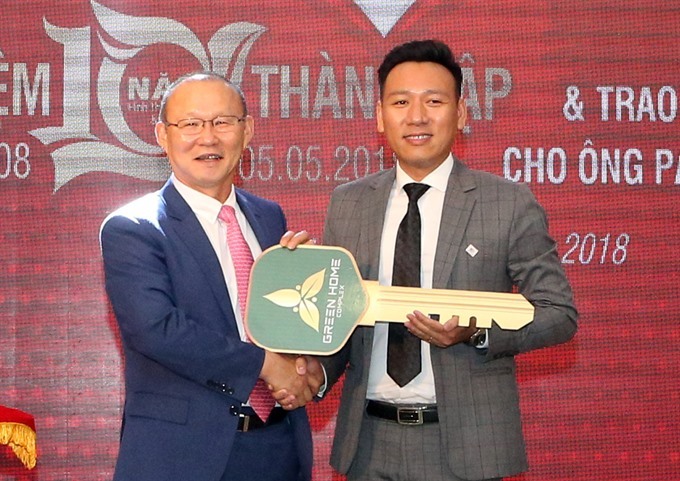 ĐÀ NẴNG — Coach of Việt Nam U23 football team, Park Hang-seo was awarded a township house in the central city, worth VNĐ2 billion (US$88,000), from a donor in Đà Nẵng on Sunday. Located in the Green Home complex project in Liên Chiểu District, the two-storey 140sq.m property on Nguyễn Chánh Street will be an accommodation for the South Korean coach whenever he visits and works in the city. The donor, the Phúc Ngọc Hoàng Construction Consultancy and Design Company, said the award honoured Park’s contribution for Việt Nam football when he helped the U23 team rank second at the Asian Championship in China in January. In January, Park also received a car from local automobile producer Thaco. Local businesses also donated nearly US$1 million cash-prize for the U23s and coaching board.